With the help of Tony Stevens, UK returned to the air on short wave on Saturday 5th February and on Sunday 6th February from a new location on 6275 kHz during February and March. Paul Johnson appeared in court on Monday 3rd April 2000 following the raid of November 1999. 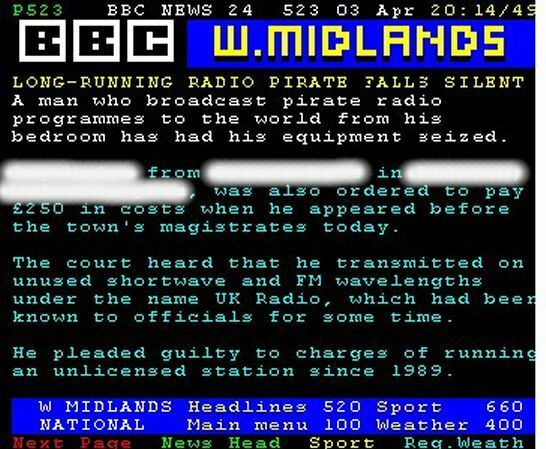 There was some press coverage on BBC CEEFAX on April 3rd, and in the Express & Star local newspaper. Paul Johnson was given a 12-month conditional discharge and was ordered by the court to pay costs of £250. UK Radio continued to broadcast throughout 2000 on short wave only. In December 2001 the station conducted engineering test transmissions on the internet via Live365. The first live programme was aired on Sunday 16th December 2001 with the first live announcement made by Paul Johnson at 8.12pm. On Sunday 13th January 2002 at 8pm, UK Radio commenced regular broadcasts on the internet via Live365 and this website. UK Radio has continued to broadcast every Sunday from 8pm until midnight UK time, with Paul Johnson, the founder member and only remaining DJ, presenting programmes. If these broadcasts are successful this would mean UK Radio would be legal and immune from any further raids, so we are keeping our fingers crossed that this is going to be a success.